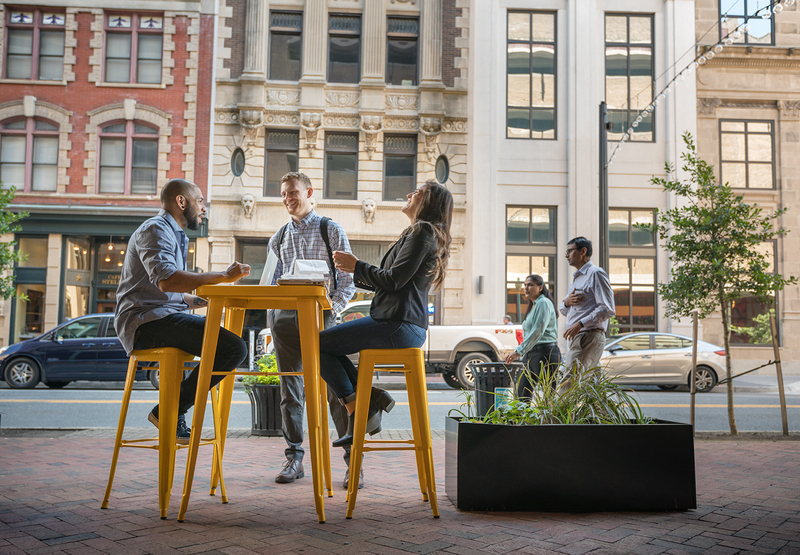 A partnership between the City of Norfolk Recreation, Parks and Open Space; Downtown Norfolk Council; Downtown Norfolk Civic League; and area residents has energized the Downtown Complete Streets initiative. The focus of the program is to review significant areas for improvements in Downtown for pedestrians, bikeability, automobiles and public transportation. Each area has a subcommittee that brings fresh ideas and suggestions to the Complete Streets committee that is chaired by Downtown resident and DNC Board Member Kevin Murphy. Recent projects have included Outdoor Dining Design Guidelines to help restaurants plan and succeed in getting improvements approved. Work Program Architects and Norfolk’s Planning Department worked together to frame the guidelines. Recent projects under consideration include new outdoor dining areas on Granby Street and Tazewell Street for Luce and outdoor dining for the new Percolator community kitchen on Monticello Avenue. Other projects include tackling pet waste in the dog park, traffic signal timing, alley beautification and upcoming Bike Month activities in May. On Saturday, March 30, volunteers will replant Downtown’s tree wells with flowers and plants from 10 a.m. to 1 p.m. Volunteers can register here.